How to move well on the tennis court? What is agility training? A lot of players and coaches do not know how to use tennis agility exercises. Agility training is not incorporated enough at low level, but it should because it is an easy way to improve a player performance. Tennis agility exercises include everything that helps a player to improve his coordination, balance and footwork. There are thousand of drills to improve tennis players agility and this will help them to be better on the court. Basic coordination drills as catching or throwing tennis ball with or without movements are an easy way to improve beginners and young players’ agility on the court. 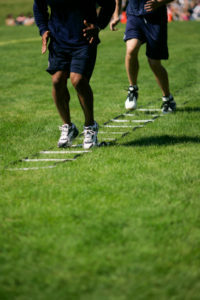 Ladder drills can be used at all levels and ages. The only difference will be the intensity and complexity of the tasks. These drills are fun and can be very helpful to improve a tennis player coordination and footwork. Tennis is an activity that involves movements in every direction this is why it is important to work on a ladder, with forward, backwards, and sideways movements. Hurdles drills can be used to help players improve their technique while moving. These drills will emphasize the different muscles action as the hips flexor. The player will have to use a good technique if he wants to clear all the hurdles and later he will be able to use this on the court and then to move better. Good tennis agility exercises also help players to improve their specific movements. Easy drills done on court as running to a ball and doing a shadow will help players to move better. In this kind of drills really focus on the first step and the recovery steps. No balls are involved, the perfect footwork technique has to be used and once the player starts to do this without thinking he will be able to it on a real situation with tennis balls. Balance training also contributes to players’ agility. This can be done on court doing drill only on 1 leg or also on unstable surfaces as BOSUs or balance discs. Depending of the level just have the players balance for 1 minute on 1 or 2 legs and then you can start to close the eyes, add shadows with rackets or tennis balls catches and throws. Working on the sand is for me one of the best ways to improve tennis players’ agility and movements. Sand is an unstable surface that makes the movements a lot harder. It will help players to work on their balance and leg strength. Once a player is able to move well on the sand, it will be a lot easier and he will be lot quicker on the tennis court. Tennis agility exercises should be included in every training program, it can be done on or off court and are usually easy and fun drills that can really help a tennis player to improve his game. There are so many different kinds of exercises, you can use books or your own imagination, just make sure that the correct technique is used. With Fit4Tennis you can get agility training and fitness program that will help you or your players to bring their game at a next level.